Hola Lola: What's this??? What's This??? What's This??? Lo washing dishes while Clay cooks. She loves to feel a part of what we're doing and we try to focus on making her a part of everything we do. I just love the "show your teeth" big smile...it's one of my favorites! Ok....Back to reality. I know I haven't posted a "real" blog in a bit but I've been focusing on voting for our rockin' kid so I haven't had time. My OCD is really obnoxious at times! But, voting is over...I'm back and ready to rock the blog. BTW...we still haven't heard word if we won but we'll know this morning...keep the fingers crossed. Thanks to everyone who diligently voted over the past couple days. Whether we win or lose, it's great to know we have such wonderful support out there! We truly appreciate it!!! 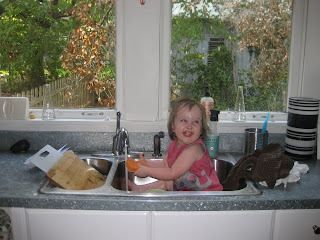 This week Lola has started something that I believe all toddlers do at one point or another. She's obsessively using the term "What's this?". Or, it actually sounds more like this "What's this Amy...Amy...What's this?" or What's this Clay...Clay...What's this?". Yes, we are still Amy and Clay but sometimes Mommy and Daddy too...whatever works for her I guess. Anyway, since Monday the "What's this?" questions have been non-stop and she uses it with EVERYTHING...even when she clearly knows what it is she is asking about. She'll look at the TV (which we usually don't turn on until she goes to bed but this week we've been bad) and says over and over and over "What's this?" ..."What's this?"... "What's this?".... "What's this?" Pointing the entire time. She also does this with her books. Last night we spent at least 45 minutes flipping through a Charlie Harper book and the entire time she was asking "What's this Amy...What's this?" She barely takes a breath in between the "What's this?" statements. I have to say it's all really cute but like every other phase I'm ready to hear something else. It can get a bit exhausting answering questions throughout the day and evening....especially when it's the same one over and over. Now I guess I understand how people feel when they are having a conversation with me as I tend to ask multiple questions over and over...you know...really trying to get the full story. Clay says I interrogate people. I don't feel this way though...I just feel I'm interested and focused on what the person is saying. Everyone likes to talk about themselves so asking questions isn't necessarily a bad trait right?!?!?!?! With that, once again, maybe this "What's this?" phase is something Lola comes by honestly. However, I'm fairly certain it's just another one of those fun toddler phases!!! I haven't done very good taking photos lately. Our battery has been dead on the camera this week and I kept forgetting to charge it. So, I'm going back to the archives. The pictures I posted today are some of my favorites as they really capture the moment (I think). 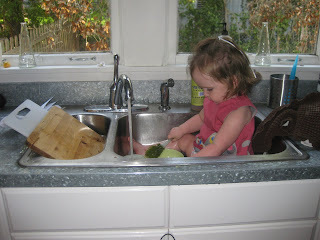 We've been trying to teach Lola to help with the chores. In the evenings, she'll help me cook or pick up a mess or put things in the trash or wash dishes...it all varies each night. 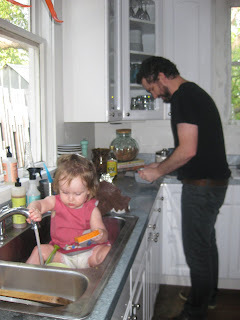 Lo actually LOVES washing dishes which is a good thing but I imagine it's b/c she's dealing with one of her favorite things...water. We also have Lola pick up all her toys/books before she goes to bed at night. We're still working on this but she's getting better. The great news is she practices "clean-up" throughout the day at school. The Montessori teaching is very hip on kids learning to do things on their own. So, any time they get a book or a toy out, once their done, they teach them to put it up. The same goes with a spill...any time they drop or spill something, they teach them to pick it up on their own. I've actually witnessed Lola doing this several times which is really fascinating b/c she still just seems like a baby to me. Oh, they grow up so fast!